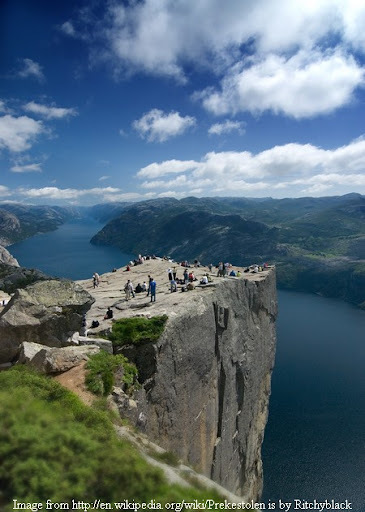 Preikestolen, English meaning Pulpit Rock, is a 604 metres high, vertical precipice in Norway. 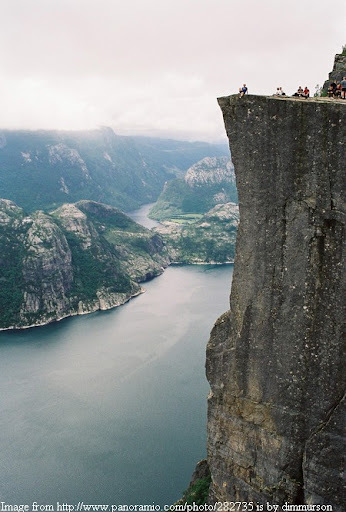 The top is a flat plateau measuring about 25 x 25 metres and only a brave hearted can go upto the edge and look down the Lyse-fjord. It is a famous tourist spot but access is not easy. Hike takes about 2 hours and quite steep at places. Click here to download a good visual presentation in Power Point. Caution: some pictures not meant for acrophobics (Those who have fear of heights). Credits: Special thanks to Shabana for bringing this to my knowledge.